Remember how I told you a few weeks ago that the Girl Scouts and the Cheetah Girls segment of Road to the Cheetah Girls One World wouldn’t be the last time that we heard of the Girl Scouts and the Cheetah Girls working together? Here’s the rest of the story. One day after the worldwide premiere of The Cheetah Girls: One World the exclusive partnership with the Girl Scouts will allow the Girl Scouts to hold viewing parties of The Cheetah Girls: One World. 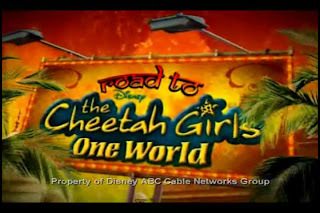 That’s right, on Saturday, August 23rd, at 7:00pm EST/6:00PM CST, any girl who has ever dreamed of being a Cheetah Girl will have the chance to see the film. The Girl Scouts will be able to use these screenings not only for the girls already involved in Scouting, but they will also be able to use these viewing parties as recruitment tools to attract new girls to the organization. Every girl will be welcome. For many of us out there who already have cable, this may not seem like a big deal. We will be able to plop ourselves down on the couch on Friday, August 22nd, and view the movie’s premiere if we so desire. However, I personally know of plenty of underprivileged children who do not have the opportunity to afford the luxuries that some of us take for granted. Yet, they still dream of the dance moves, the fashionable clothing, and the belted out songs that the Cheetah Girls offer. These young women would give anything for the chance to be a part of the Cheetah Girls, or to just watch the movie the same weekend every other girl at school gets to view the movie. And now, thanks to the combined efforts of Disney and the Girl Scouts, all girls can dream with the Cheetah Girls together. Girl Scouts is about giving a girl or young woman the tools she needs so that she can hold her head up high and not be afraid of the world, because she knows she can conquer it. Seeing a movie on its opening weekend may not be the solution to all of the world’s problems, or even to all of the problems a young woman faces in today’s society, but if it helps just one girl raise her head a little higher come Monday morning at school, then this partnership has been a success in my eyes. Plus, word has it, this is going to be a really fun movie.